I am a follower of Jesus Christ, whom I deeply love. I have been married to my best friend, Doug, for over 30 years. God has blessed me with 7 incredible kids that call me "Mom". My 7th recently married my son, Russ, and became my daughter-in-love. 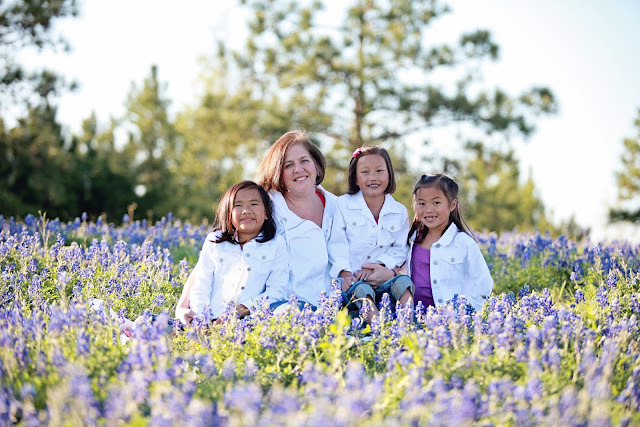 We have adopted 3 girls from China - Kate (10), Rachel (9), and Ellie (9) and finally, Abby (8). We hope to bring her home in late Fall 2013. God has used this life changing journey to grow in me a huge heart for orphan and adoption ministries. I love helping others through the adoption process and being a personal resource for people throughout each stage of this wonderful ministry. I love to share my journey with Christ, as seen in this blog, through speaking at women's events around the country. Feel free to contact me if you are interested in having me come speak to your group. Thought this might be Rachel. I have just been reading your blog - Pascha sent me the link. Boy, have you all been busy since we last saw you! Delighted to read about Kate, Ellie, Rachel and Abby....and not to mention your 3 all-grown-up kids and spouses! My name is Colleen Biegger and I am an adoptive mom as well. Elizabeth came to us 5 years ago at the age of 6 and I have 3 bio boys as well. You have a beautiful family! The reason I am writing is because I have recently become involved with a mission based company called Trades of Hope. One of our founders is an adoptive mom as well and started an orphanage in Haiti when she was troubled by the conditions she found her daughter in. Since then she has wanted to find a way to empower women all over the world to be able to provide for their families and so Trades of Hope was born. My own daughter encouraged me to do this and she just loves that we are helping mommies like her birth mom. So it has been a special project for us to share. We are finding that bloggers have been a wonderful way to get the word out about our company and so I guess this is a "cold call" to see if you would have an interest in writing about what we do. We can also arrange a give away of one of our products if you would like. Feel free to contact me with any questions. I have traveled to Haiti myself with this company and they are doing fantastic work. I hope to hear from you!